Summer is a popular time for weddings, with flowers in bloom, warm breezes, and blue skies. 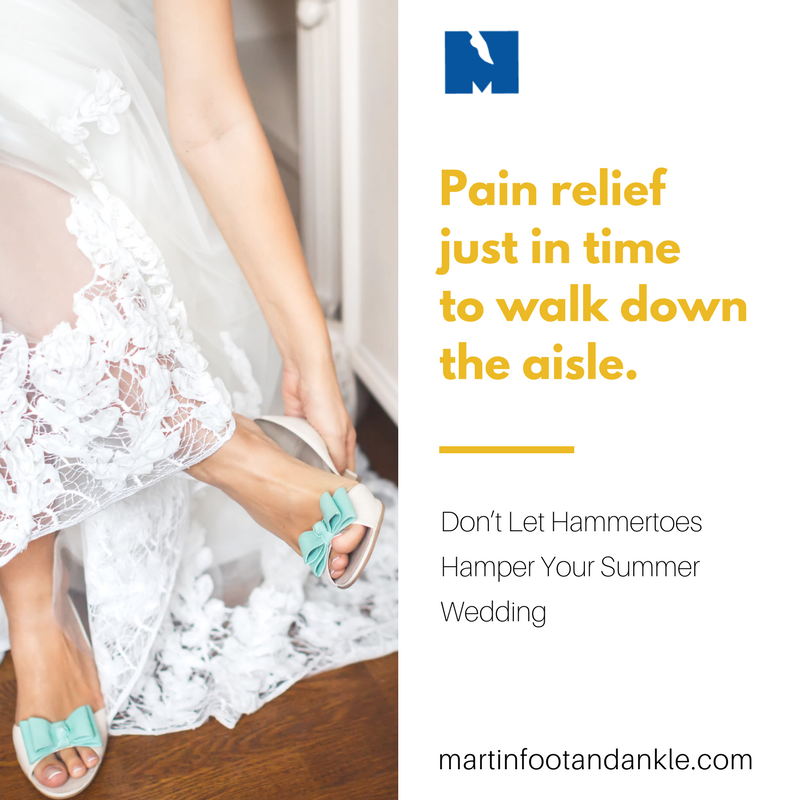 However, if all that peacefulness and beauty is hard to enjoy because your hammertoes are crammed into your wedding shoes and causing you pain, you better do something now so you can walk down the aisle without cringing! The main cause of hammertoes is a muscle/tendon imbalance, so stretches to build strength and flexibility, as well as night splints to hold your toe in proper, flat position will help in getting your muscles and tendons to work together and keep your toe straight. Ice and anti-inflammatory medication can help with swelling and discomfort wearing shoes, as well. Speaking of shoes, narrow, tight ones that crowd toes can aggravate the condition because this type of footwear encourages hammertoes to scrunch back into an abnormal curled position. In addition, the joint and tip of the toe can develop painful corns from the pressure and friction of rubbing on shoes. If you make a habit of wearing high heels – stop! Look for styles that offer plenty of room in the toe box. This doesn’t mean you have to give up your pumps for good, just save them for special occasions, like, say, your wedding day, for instance!